This lollipop recipe is easy to make and perfectly customizable. Change up the colors, flavorings and decoration to suit your theme. I love making this lollipop recipe because it makes a big impact and doesn’t take a lot of work. Perfect for those trendy lollipop cakes! What ingredients are in a lollipop recipe? The great thing about this simple homemade lollipop recipe is that the ingredients are easy to come by. Anyone can make them. You probably have these ingredients in your house already if you do any amount of baking. All you need is granulated sugar (not powdered), corn syrup, distilled (or bottled) water, candy flavoring and food coloring if desired. I also added some sprinkles to my lollipops for decoration. Candy flavoring might be the odd ingredient in there but it’s easy to find. 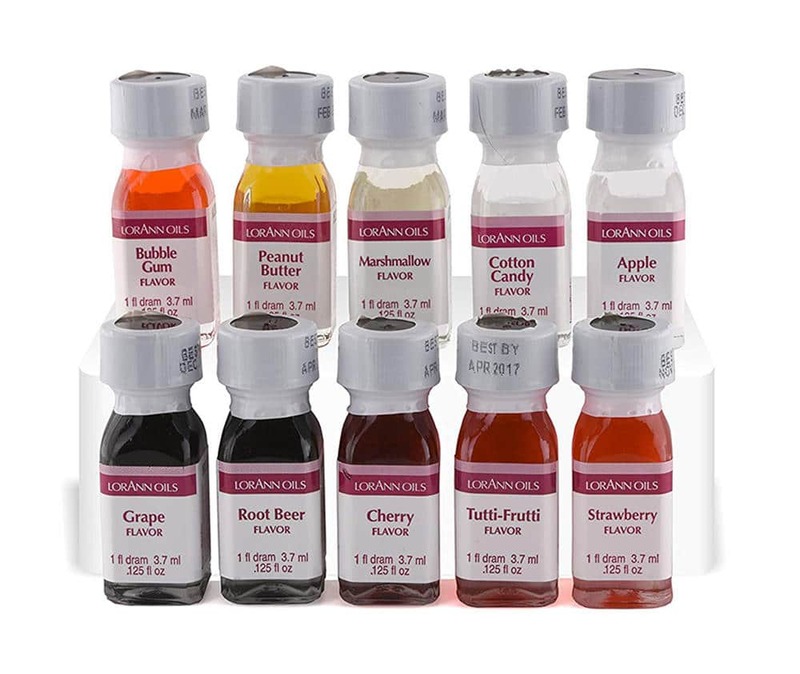 You can get candy flavoring at stores like Michaels or Jo-Anns craft stores or in your local cake decorating supply store. Candy flavoring is specially formulated to withstand the high temperatures of hot sugar without losing it’s flavor. You can’t use juice or extracts in place of candy flavoring and get the same results, unfortunately. 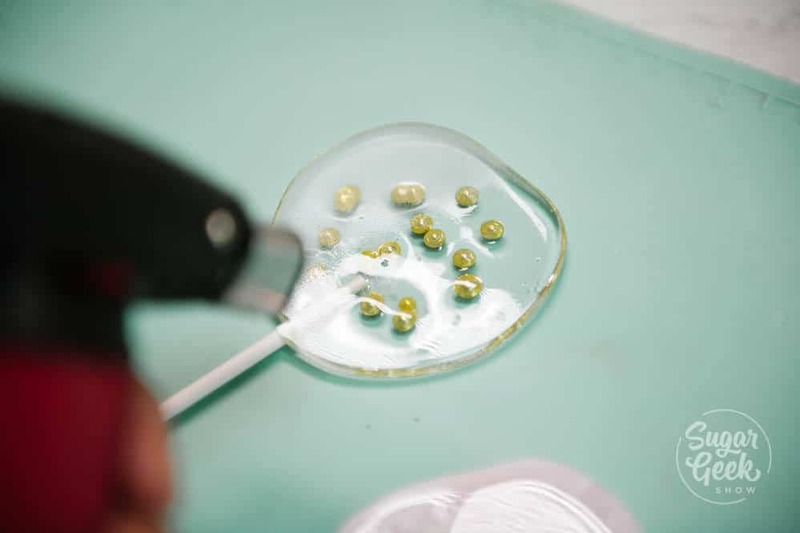 What equipment and tools do you need to make a lollipop recipe? To cook sugar you’re going to need some equipment to make your life easier. I don’t use any lollipop molds for this lollipop recipe but you can definitely use molds if you need a specific shape or size. Just make sure you are using molds made for hard candy, otherwise, they could melt from the hot sugar. Making the lollipop recipe is actually pretty simple when it comes down to it. Combine your sugar, corn syrup and water in your saucepan and bring it to a boil. Reduce to medium heat to a steady simmer. No need to stir. Cover your mixture with the lid for 5 minutes. This causes condensation to form on the lid which will drip down the sides of the pan and wash away and stray crystals of sugar which can cause crystallization if not melted. Alternatively, you can also use a clean pastry brush and fresh water to brush around the sides of the saucepan to wash down the sugar crystals. Just make sure it’s a new pastry brush and doesn’t have any grease or food debris in the brush that might ruin your candy. Once the mixture is bubbling away, insert your candy thermometer and remove the lid. This is the part where we have to wait for the water to evaporate out of the mixture. That might take a few minutes. 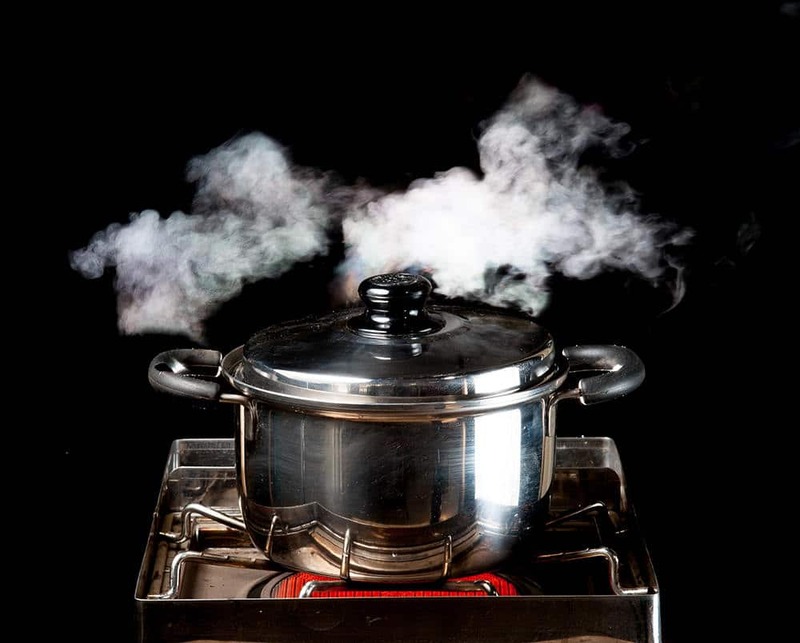 You will notice that your temperature will stay around 225ºF for a while until all the steam disappears. Do not stir the mixture at all. 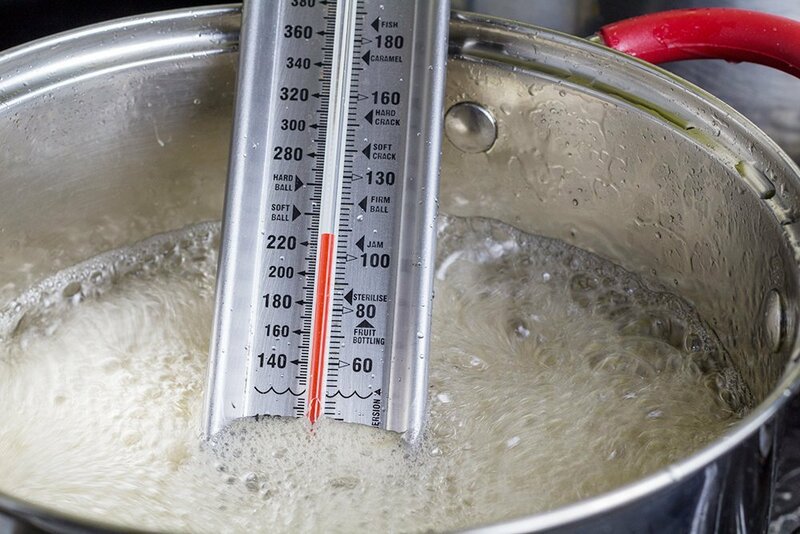 Watch your candy thermometer carefully, as soon as all the steam disappears and your water is gone, the temperature will rise quickly and you don’t want to burn it. Let your mixture bubble until it reaches 300ºF which is called the hard crack stage. Once you reach the hard crack stage, remove the mixture from the heat. Stir in your flavors and colors now if you prefer. Now you can pour your candy into your molds or onto your silicone mat to make your lollipops. To make your homemade lollipops, wait for your mixture to cool down a bit so it gets a little thicker. If you pour 300ºF sugar onto your mat it’s going to run all over the place. You can also pour your candy into a smaller silicone measuring cup to have more control over the shape of your lollipop. If you need a lollipop template you can print out my lollipop template to place under the silicone. Make sure you wear some protective silicone gloves to prevent sugar burns. 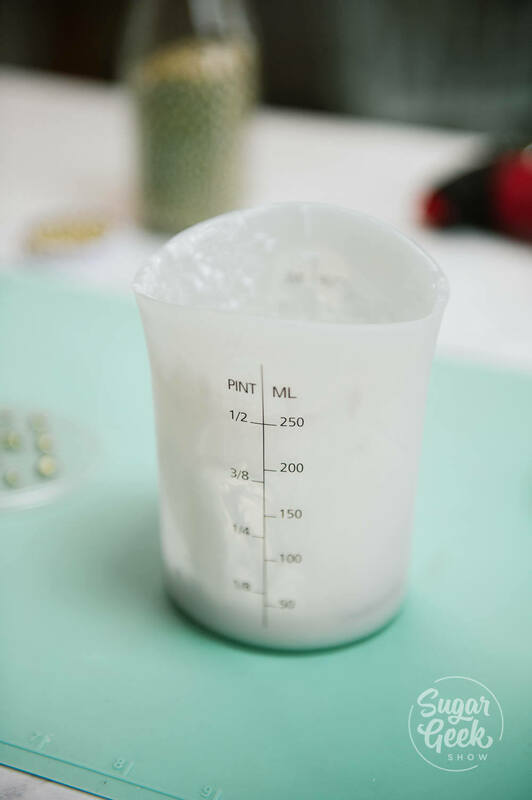 Do a little test pour if you need to to make sure that the sugar is keeping it’s shape. Make sure your surface is level or you’re going to have a hard time getting round lollipops without a mold. Place your silicone mat over the template and pour your sugar until it’s slightly smaller than the circle. Place one of your lollipop sticks in the bottom 1/3 of the hot sugar then turn it over so that the stick is totally covered (see video). If you’re adding sprinkles, you can put a few on top now. 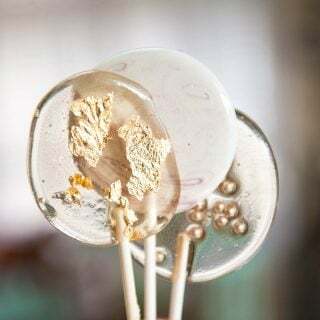 For the gold leaf lollipops, I placed the leaf on the lollipop right after pouring. To make my marbled lollipops, I colored my candy with a drop of white food coloring and another bit with a drop of black food coloring. Swirl together and pour. If you want your lollipops clear, only add food coloring. If you want them to be opaque, add a drop of white food coloring along with your color. Let your lollipops cool for 10-15 minutes before lifting them off the silicone mat. Once your pops are cool you can lightly torch the back side to make them crystal clear (optional). How long do homemade lollipops last? Lollipops don’t really have an expiration date since they are made of sugar and sugar is naturally self-preserving. Don’t tell me you’ve never eaten year old Halloween candy. I know I have. I did a little test and left my lollipops at room temperature for a few weeks just to see what would happen. It’s February so we got all kinds of weather. Snow, sun, rain, hail. The only thing that happened was they got a little sticky. They probably wouldn’t have gotten sticky if I kept them covered but I wanted to know if the air would affect them. If you’re in a very humid area you should def keep them covered or individually wrapped with cellophane to keep the lollipops from turning into a sticky mess. You can pour leftover lollipop sugar onto a silicone mat and let it cool completely. Crush it into pieces an store in a plastic ziplock bag. Then you can re-melt it whenever you need some hard candy. No need to bring it back up to 300ºF, just melt in the microwave in a heat proof container. Can you make this lollipop recipe without corn syrup? This lollipop recipe contains corn syrup because corn syrup prevents crystallization. In some places of the world, it can be hard to get corn syrup. No worries, you can still make homemade lollipops without the use of corn syrup. Simply leave out the corn syrup from this recipe but be very careful to wash down the sides of your pan to prevent sugar crystals from growing. If your sugar does crystallize, there isn’t a way to save it. How do you make a lollipop cake? 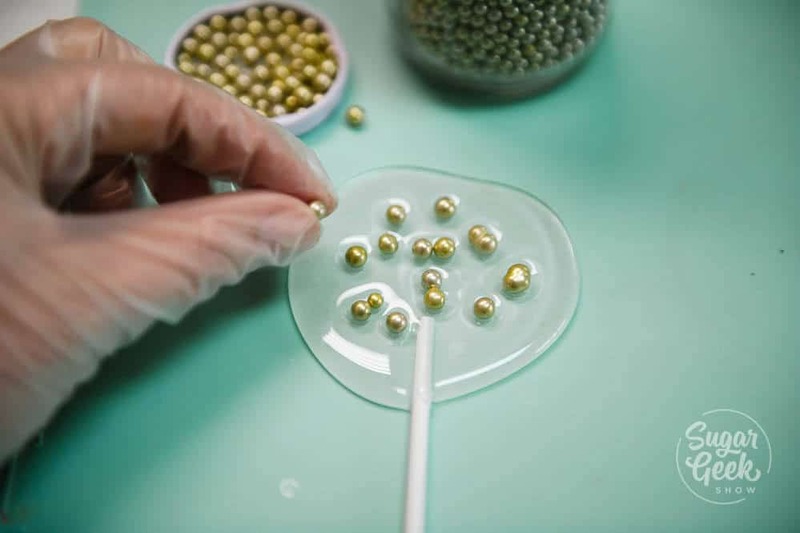 You may have seen some trendy lollipop cakes on Instagram lately and wondered how they make them! I decided to make one of my own with my lollipop recipe and I love how it turned out! I made three different types of lollipops. Clear with gold leaf, clear with gold dragees and white marble. I made three of each kind and arranged them on top of my cake. 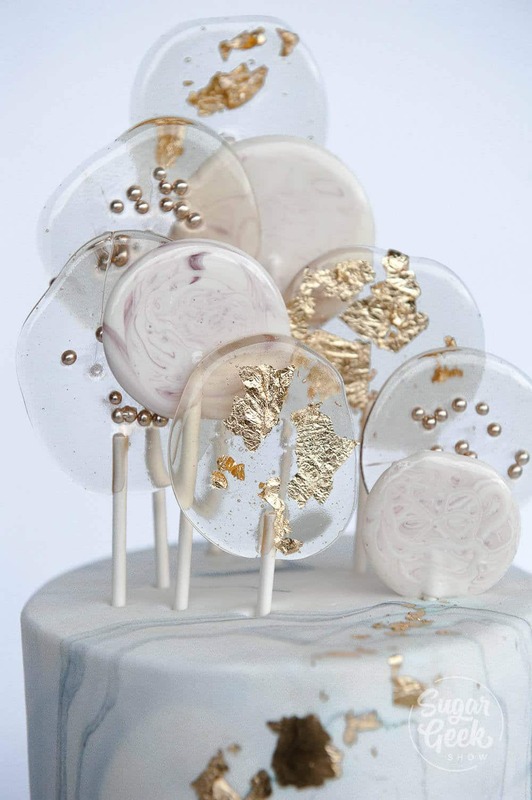 I decorated my marbled fondant cake with some gold leaf to match the lollipops and love how it turned out. The key is to arrange the lollipops and varying height and mix and match them so they look balanced. 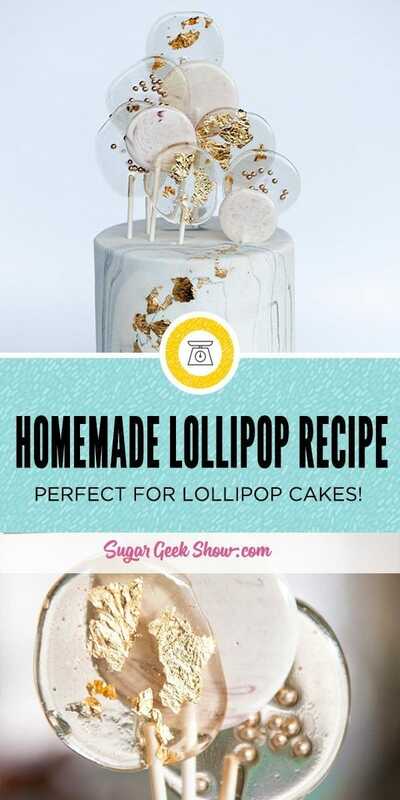 Want to learn how to make your own lollipop cake? 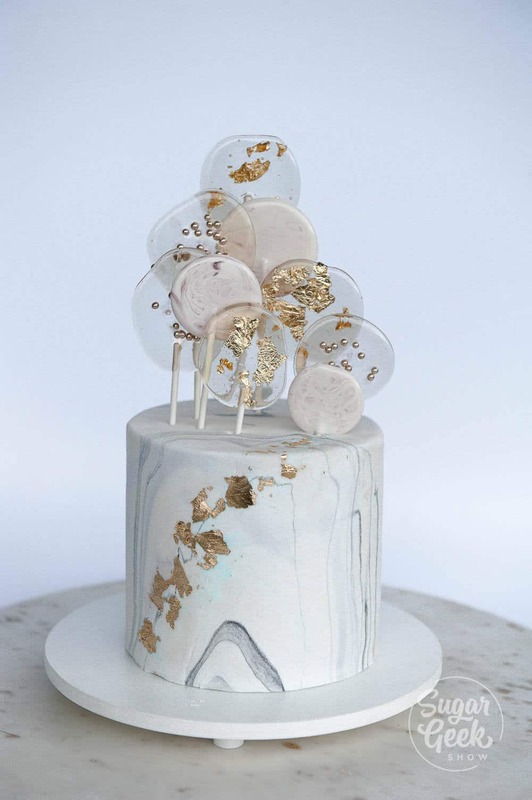 Watch this video on how I created some beautiful gold and marble lollipops and used them to decorate my marble cake to create a trendy lollipop cake design! 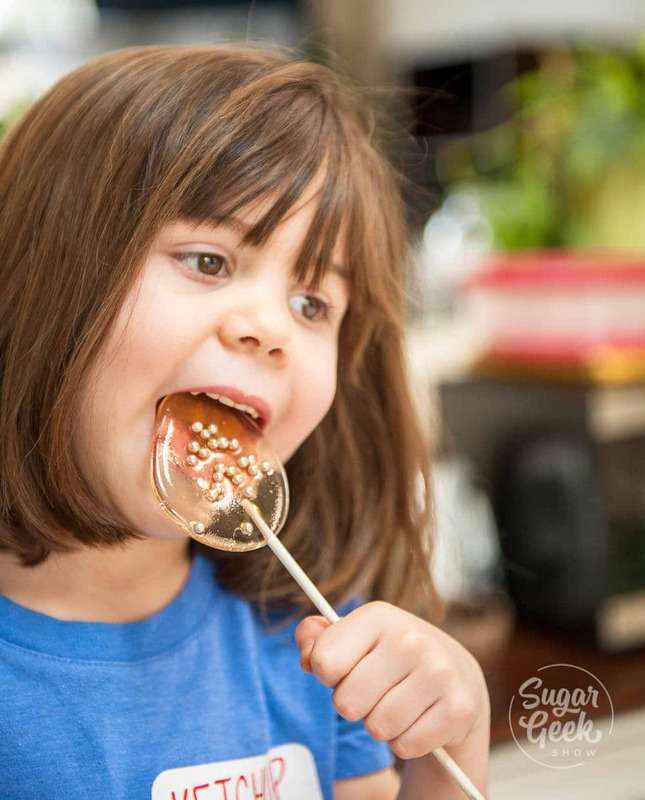 For a sugar-free lollipop option, use Simi-Cakes ready to melt isomalt. Homemade lollipops are fun and easy to make. The flavors and colors can be easily customized. The perfect homemade treat! Cover the mixture with the lid and let condensation build for 5 minutes (this helps to wash the sugar off the sides of the pan). Remove lid and reduce heat to medium. Insert candy thermometer and let mixture cook (do not stir) until it reaches 300ºF. Let mixture cool a bit until it's thick enough to hold it's shape when poured and then pour into circles on your silicone mat (or into your candy molds). Insert your lollipop sticks and let cool completely before removing them from the mat. Torch the back sides of the lollipops (optional) to make them super clear. Store in air-tight containers at room temperature or wrap individually to prevent them from getting sticky.